"....Trista Reynolds, the mother of the toddler who disappeared from her father's Waterville home in 2011, said she is focusing on her growing sons...."
"...Trista Reynolds’ sons are getting older and Raymond, who turns 4 Tuesday, is beginning to understand more. Reynolds said her growing sons are one reason that she plans a quiet remembrance of her daughter Ayla, whose fifth birthday is April 4...."
Yes they are searching a property for that first girl in the story. It is where one of the guys lives that she went riding with that night. Not sure if anything came out of the search but it would be nice if the family got an answer to where she is. It's Justin DiPietro's first brush with law enforcement since 2013. "....Justin DiPietro, the father of missing Waterville toddler Ayla Reynolds, was arrested on a charge of operating under the influence on Nov. 6 in Newcastle. Lt. Mike Murphy of the Lincoln County Sheriff’s Office said DiPietro, 28, of Waterville, was arrested at 9:30 p.m. on U.S. Route 1. Murphy said a deputy stopped DiPietro because his driving appeared out of the ordinary. DiPietro was given a roadside sobriety test and a breath test and taken to Two Bridges Regional Jail in Wiscasset. Murphy said the case is pending. He did not have details about the make and model of vehicle or what about DiPietro’s driving caused officers to pull him over. “I don’t have that information available right now,” Murphy said. Murphy said he knew DiPietro is Ayla’s father but is still surprised by the attention that his arrest has attracted. “Other than that, there is nothing extraordinary about this OUI,” Murphy said. 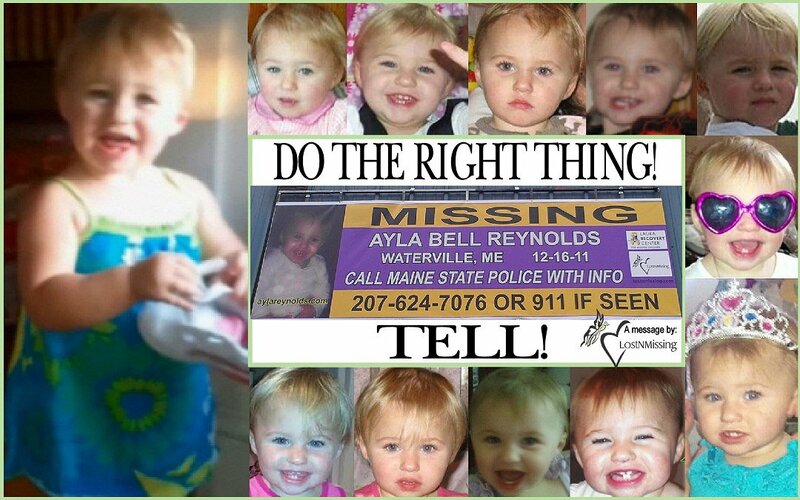 Ayla was reported missing Dec. 17, 2011, from her home at 29 Violette Ave. in Waterville. DiPietro told police he had last seen his daughter in her bed at 10 p.m. the night before. In September 2013, DiPietro pleaded guilty to violating conditions of release related to a traffic stop, in which police found alcohol in his vehicle. He was sentenced to four days in jail, which he already had served, and ordered to pay a $150 fine. DiPietro also had faced a charge of assault related to an incident in July of that year involving his then-girlfriend Courtney Roberts, but that charge was dropped because Roberts changed her story after filing the complaint, police said at the time...."
Ayla was 20-months-old when she was reported missing from her father's Waterville home in 2011. Police have said Ayla's father and two others in the home know more than they are revealing. Police said they have investigated 1,500 leads over the last four years. "We have coordinated our efforts over the last four years with Waterville police and the Maine Warden Service. The three agencies combined have done an immense amount of work and that work continues," state police spokesman Steve McCausland said. Posted Jan. 05, 2016, at 5:03 p.m. "....The father of missing toddler Ayla Reynolds pleaded guilty last month to operating under the influence on Route 1 in Damariscotta. Justin DiPietro, 28, of Waterville pleaded guilty to Class D criminal OUI on Dec. 17, 2015, according to court documents. He was ordered to pay a $700 fine and his license was suspended for 150 days. DiPietro was arrested and charged with OUI on Route 1 in Damariscotta at 9:33 p.m. Nov. 6, according to court documents. Lincoln County Sheriff’s Deputy Ryan Chubbuck was the investigating officer...."
"....After blood belonging to Ayla was found inside the basement of DiPietro’s residence, investigators from the Maine State Police said they believe the toddler no longer is alive...."
"....AUGUSTA (WGME) -- Today in Augusta, families of murder victims and unsolved missing person cases will rally at the state house. They are asking lawmakers to pass new legislation that would extend the time period for when wrongful death actions can be filed. Under Maine's wrongful death statute, families currently have two years to bring an action against someone, but this new legislation would extend that to six years in cases where a person's death is ruled a homicide...."
"...The father has told police he believes Ayla was abducted. Investigators who found blood in the father's basement bedroom say they believe Ayla was killed. Ayla was staying with her father in Waterville the day she disappeared. ..."
"...A wrongful death suit differs from a criminal complaint. Wrongful death claims are brought against a defendant who has caused someone's death either negligently or through intentional harm. Since Ayla has now been declared dead, Trista can file a complaint. ...."
".... Trista hopes to depose the last three people to see Ayla alive: DiPietro, his sister, and his ex-girlfriend. Investigators have said the trio have not been forthcoming and may hold the key to discovering what happened to Ayla. 'There are some things that I know that nobody else knows, and there are things I've seen that nobody else has seen,' Trista said. 'What I do know, is no, I don't think they'll ever find Ayla's body.' ...."
"....Trista Reynolds claims no one can find Justin DiPietro, who reported angelic Ayla Reynolds, aged just 20 months, missing in 2011 in Waterville. Although the body was never found and no charges have been filed, a judge declared her legally dead in 2017, so Reynolds announced in December last year that she is suing the girl's father for wrongful death. But she says her team is running out of time to serve DiPietro with legal papers. She posted a plea on social media Tuesday morning, writing that time is running out. If DiPietro isn't served with the summons by Sunday, 90 days from when the complaint was filed, the whole case could be thrown out. ...."
"....The little girl's blood was found in DiPietro's home and car and law enforcement have said he is withholding information about her disappearance. ...."